A beautiful fully restored 15th century house up a private 1km lane in a perfectly peaceful location, 2km from the village of Sermaise (49140), 10km from the picturesque small towns of Baugé and Beaufort-en-Vallee. The well-known cities or Saumur and Angers are just 30 minutes away. Baugé is a medieval small town with a castle and many small shops. Beaufort-en-vallée is also a beautiful small town with a coffee shop and fast food restaurant. For those desiring good quality French food there is a wonderful restaurant in the village of Gée just five minutes away. Other restaurants are in nearby villages or in the larger towns. Furnished house with TV, DVD player, wireless internet, washing machine, fully equipped kitchen incl. dishwasher, microwave oven, cooker, fridge/freezer, senseo coffee machine, filter coffee machine, etc. Wood burner. Electric heating upstairs. Three bedrooms, of which two are very large. Suitable for six people (two queen size beds, bunk beds, one pull-out bed). Baby bed, baby bath, stair gates, high chair etc. Lounge/dining room with decorative 15th century wattle and daub wall and 15th century bread oven. Private patio with patio furniture and barbecue. Landscaped gardens. Views over fields. Table tennis table, boules, etc. under barn. Our lane is perfect for walking and safe for children riding their bikes as it only leads to two houses. Two lakes for summer swimming less than 15 mins away, both with playgrounds for children and bars with crepes, etc, one with pedalos, new water skiing cord. Open-air swimming pool 10 minutes away with water slides, indoor swimming pool with slide and sauna, hamas just 10 minutes away in Beaufort-en-Vallée. 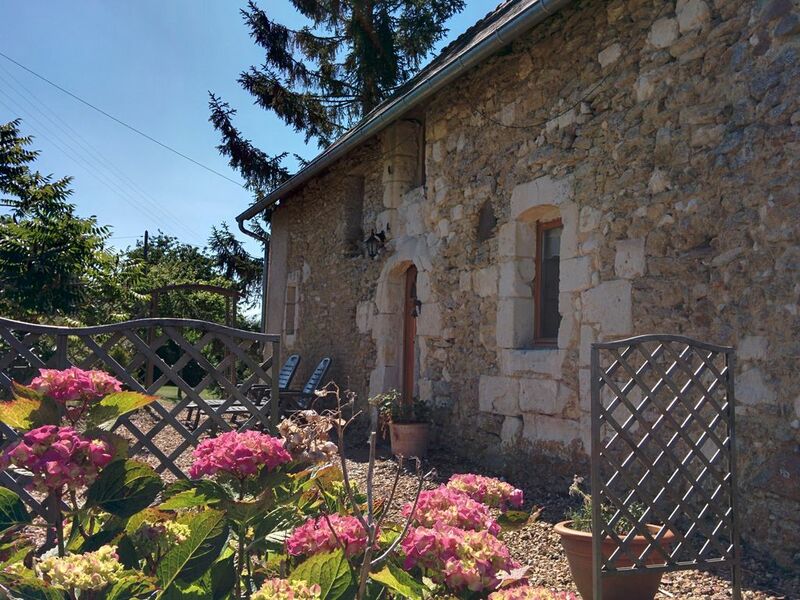 Wonderful location for visiting vineyards (one just five minutes away), chateaux, walking, cycling (three adult bikes at the property for your use + three children's bikes), etc.. Late offers available. Minimum two nights in low season, minimum one week in high season. For other details and for reservations please contact us. Non-smoking property. Please no pets. We speak English and French and are here to welcome you and answer your questions. Extremely peaceful location up private lane - 0.75 km from main road. Sheets provided. Sunbeds and charcoal barbecue. Lovely views across fields. Fish pond. Barn with table tennis table. Free bikes. Toilet, shower, wash basin. Also washing machine. Fantastic location, far enough away from towns but still near enough for shopping etc. The house has everything we needed, and was big enough for our family of 5. Charles and his family are fantastic and could not do enough for us. Thanks for a great stay. 5 Stars. Great to host you. We hope to see you again in the near future. Six of us stayed in this beautiful cottage. It is very close to some lovely towns along quiet roads. The children all enjoyed playing together and we especially enjoyed the table tennis! Maison confortable avec beaucoup de caractère. Très gentil accueil de Charles. Un gros plus : beaucoup de jouets et livres d’enfants. Idéal pour un séjour en famille. Activités et visites nombreuses tout autour de Sermaise.